The Russian Military of Defence released a video showing an ‘anti-aircraft’ competition which has participants using tanks and other weaponry in order to eliminate simulated armed groups. 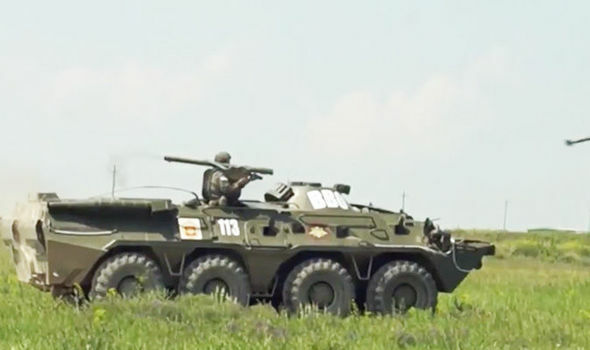 The competition called ‘Clear Sky 2018’, as the groups are trained at Yeysky range in the Krasnodar region in southern Russia. In previous years, teams from China, Venezuela, Egypt, Belarus, Kazakhstan, Serbia and Russia have taken part. This comes as Yulia Skripal appeared on camera for the first time since the Salisbury attack in March. Ms Skripal said: “I came to the UK on the 3rd of March to visit my father, something I have done regularly in the past. “After 20 days in a coma, I woke to the news that we had both been poisoned. The Russian government released another video earlier this month which highlights Vladimir Putin’s powerful anti-aircraft gunners in action. Around 200 anti-aircraft gunners were involved in the combat shooting and more than 50 pieces of military equipment were used. Servicemen of the anti-aircraft missile unit of the 150th Motorized Rifle Division of the Southern Military District destroyed cruise missiles from Tor-M2 surface-to-air missile systems. The Russian foreign minister this morning said the British response to the Salisbury spy attack was “irresponsible” and “not based on evidence”.